The Rebel Sweetheart. : A Whimsical Wedding. I'm off to a wedding today. And it's my sister who's getting married. She's the youngest in our brood of three, and since our marriages came in chronological order (mine in 2008, my brother's in 2009), that means my Mum will be giving away the last of the Mohicans. Har! Seeing my sister all dolled up in her wedding gown makes me feel a bit sentimental, and a tad older. I guess her lavish 18th birthday party six years ago got stuck in our memories too much. And now we're already marrying off our debutante. LOL. Praying for good weather this afternoon. Sendong, please stay away from Villa Evanzueda today. You can shower the couple with your blessings tomorrow. Or at least after the wedding has commenced. 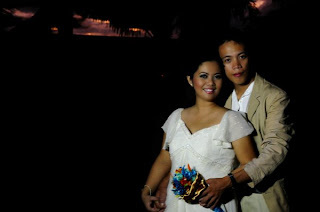 congrats to Epeh and Jesser!payat ni Epeh mars!hope it will really not rain...pero if ever blessing nmn daw un! Naku mars sobra sobrang blessings dahil walang tigil ang ulan. LOL. Hanggang sa golden wedding anniversary na daw nila ang blessings na natamo nila today.